Well, it’s been quite the adventure for us, trying to return to Cambridge Bay after the holidays, especially with the blizzard that continued for the week! Christine ended up having some extra time to shop in Edmonton, while Gloria took the time in Yellowknife to perform a short acoustic set at the Cellar Bar & Grill. A big thanks to Mel Leonard for hosting the event! 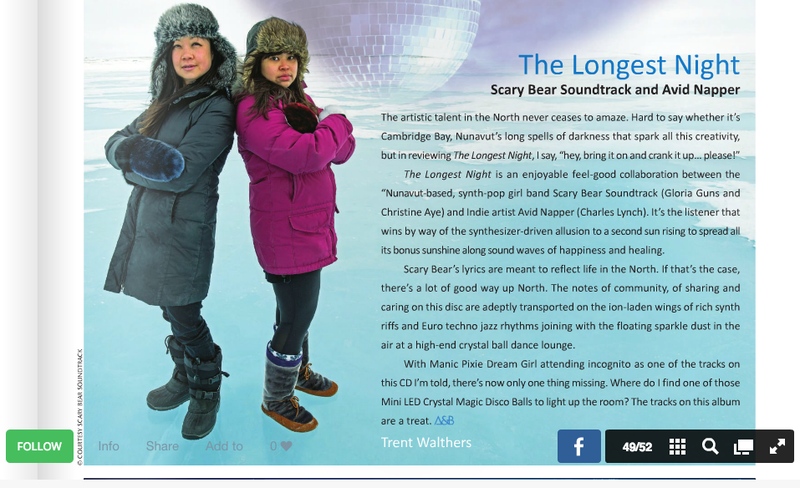 The magazine Above & Beyond published a lovely review of our album the Longest Night. Thanks so much for your kind words! You can read it here on page 49. Also, a warm thanks to Simon Edwards for playing our music on his radio show Loose Canon on British community radio station 6 Towns Radio from Stoke-on-Trent in Staffordshire . We are loving the love we’ve been getting from our British friends! If you missed it when it first aired, you can listen to the mixcloud stream here. Finally, we are excited to announce that we will be performing at this year’s Kitikmeot Trade Show this year during their community entertainment night! The trade show is always one of the busiest events in Cambridge Bay, and at last year’s community entertainment night, the community was treated to performances by Kelly Fraser and Nelson Tagoona. We look forward to being a part of these events this year! Stay tuned for more news soon about our new music video project we’re working on. We may ask for your help!